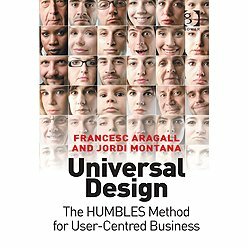 Universal Design: The HUMBLES Method for User-Centred Business, written by Francesc Aragall and Jordi Montaña and published by Gower, provides an innovative method to support businesses wishing to increase the number of satisfied users and clients and enhance their reputation by adapting their products and services to the diversity of their actual and potential customers, taking into account their needs, wishes and expectations. The HUMBLES method (© Aragall) consists of a progressive, seven-phase approach for implementing Design for All within a business. By incorporating the user’s point of view, it enables companies to evaluate their business strategies in order to improve provide an improved, more customer-oriented experience, and thereby gain a competitive advantage in the marketplace. As well as a comprehensive guide to the method, the book provides case studies of multinational business which have successfully incorporated Design for All into their working practices. * As a thank you for your purchase, the Foundation will contribute towards the cost of delivery, as reflected in these reduced delivery costs.